Editor’s Note – A new app is connecting farmers to consumers in Spain. The app simplifies order management, coordination between groups, and makes distribution more efficient by minimizing the carbon emissions caused by transport. This article was originally posted on FUTUREPERFECT and written by Alejandro Panés. 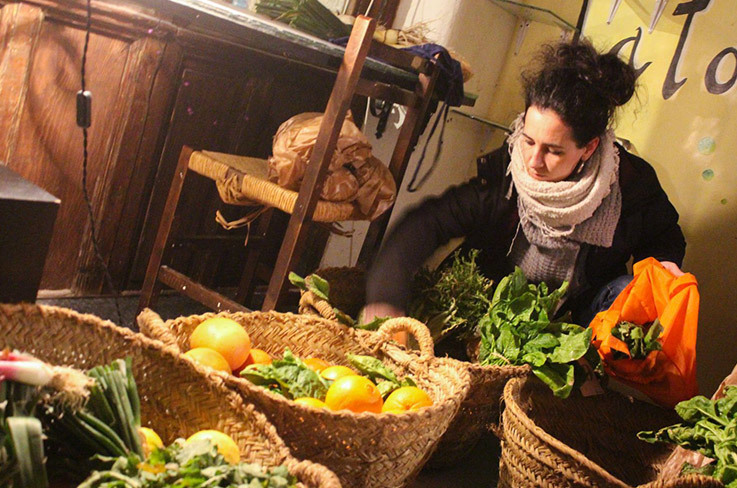 Buying organic produce directly from local producers: the Karakolas app has become a particularly useful tool for Madrid consumers. It is 8.30 pm. As it does every Tuesday, the group La Dinamo is meeting in La Tortuga cultural center of Madrid to pick up their organic produce orders. 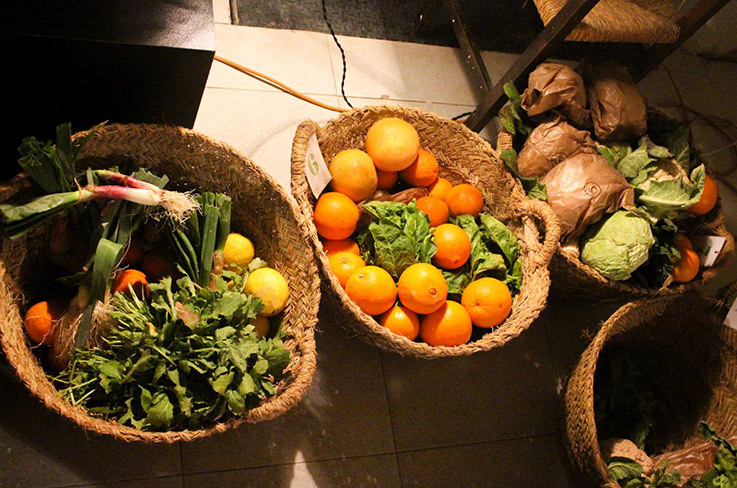 Wicker baskets full of oranges, chard, lettuce, leeks, onions, cauliflower, lemons and more await them. It is all organic, grown by small producers who use no pesticides. The members of La Dinamo not only seek to keep up a healthy diet, but also to consume in a socially-conscious manner. The air is full of ideas like sustainability, food sovereignty or reducing the carbon footprint left by transport; the way the produce is collected, as well as all the other work involved, show these ideas are put into practice. At a table in the center of the room, three members are at work organizing today’s order and receiving payments (it’s their turn). “We are a group comprising 25 units. Each unit has a basket assigned to several people, and every Tuesday it’s the turn of two different units to open and close the order, deal with the supplier and organize the pickup,” says Pilar J., the representative of one of the two units distributing today. “The supplier receives the complete order, and then we have to divide it up into units.” They charge each unit what is owed. Then they handle the accounts and organize the order for next week. To organize these exchanges with the producers, consumer groups like La Dinamo use the free software application Karakolas, which simplifies order management, coordination between groups and makes distribution more efficient by minimizing the carbon emissions caused by transport. The idea was the brainchild of Pablo A. in 2011. At the time, he was a member of the consumer group Karakoleka in the Madrid neighborhood of Lavapiés. His group used Excel spreadsheets shared on Google docs to organize itself. However, managing an Excel table among some 70 people is extremely error-prone and causes many mistakes in orders. They had to ask an IT specialist to fix things, and this proved to be time consuming. They wanted a system that would work better, be more efficient, and that did not rely on either spreadsheets or Google docs. “A system we could develop and correct so that errors would not become a recurring problem,” says Pablo. The Karakolas app home page. In 2012, they started to use it in Karakoleka, and other groups gradually began to join. In the first assembly, in 2014, they agreed on a coordination structure consisting of a delegate from each group, who would be responsible for communication with the management team of the app. In September of that year, the intermediary La Ecomarca joined, giving a big boost to the project by adding 39 producers and 19 consumer groups to the network. 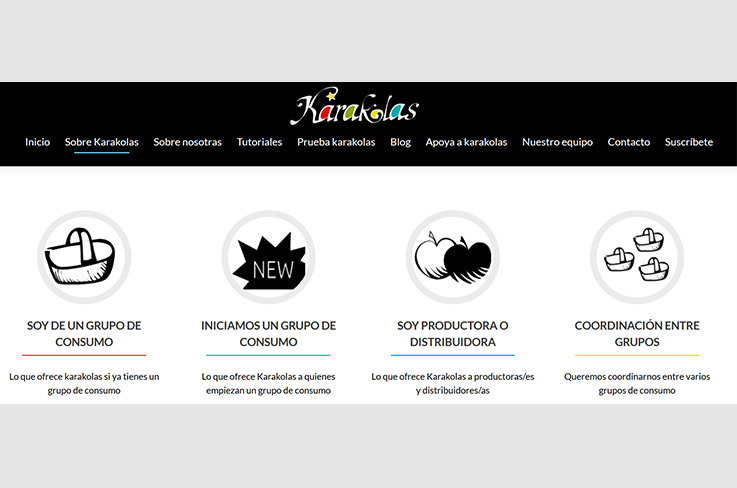 Over time, Karakolas has become an effective tool for coordinating not only individuals but also consumer groups. For a producer who lives some distance from Madrid, or for an intermediary, it is much more efficient to be able to organize orders and distribute to different groups in a single delivery rather than separately. Working together to improve the app Participation is basic in this project. Any user of Karakolas can propose, through the group’s delegate, an improvement or modification to the app. One example: upon joining, Ecomarca suggested and paid for software changes and enhancements that the entire network is now benefiting from. “This tool did not exist previously, and there was nothing that could adapt as well to the diversity of consumer groups. But mostly, it is a really nice example of collaboration” , says Luis Rico, the head of Ecomarca. “The problem with these structures is to consolidate a funding model.” Previously, Karakola’s income came from the voluntary contributions of consumer groups and the sale of merchandise like bags or T-shirts. “Most of the management team’s work is on a volunteer basis”, says Pablo, “although we have managed to remunerate one person’s work part-time.” However, the funding model will now be mixed going forward: some groups will participate in management and make voluntary contributions, while others will be user members paying a fixed quota. Thus, the people at Karakolas expect this original and innovative project to pass the test of time and help change not only our habits of consumption, but also the way we look at the economy.